Keppel Land China formed a joint venture with Gemdale (Group) to develop an 8.8 ha residential site in Nanjing, China, in an around 1.414 billion yuan, or S$283 million, deal, it said in a filing to SGX before the market open on Thursday. Mapletree Logistics Trust’s manager said on Thursday that it planned a private placement of 303.889 million to 313.545 million new units at an issue price of S$1.196 to S$1.234 each to raise gross proceeds of up to S$475 million, including an upsize option. The issue price range is a discount of around 2.5 percent to 5.5 percent to the volume weighted average price of S$1.2651 per unit on 19 September, it said. The Straits Trading Co. said on Wednesday it entered a joint venture with Australian property developer Commercial & General to acquire three logistics assets. Under the new joint venture, Straits Trading’s subsidiary Straits Real Estate will hold 80 percent of an asset-holding trust called ILP No.1 Trust and 50 percent of ILP Managers Pty., a company which provides investment management services, it said in a filing to SGX on Wednesday after the market close. Ho Bee Land said on Wednesday that it promoted Chua Wee-Chern Nicholas, age 43, to deputy CEO from group director (business development) as part of the group’s succession planning. Chua joined the company in 2002 and most recently was involved in developing the business in Australia, China and Europe, it said. Chua is the son of Chua Thian Poh, who is chairman, CEO and a substantial shareholder of Ho Bee Land, it said. Ong Chong Hua was also appointed chief operating officer, in addition to his current role as executive director, it said in the filing to SGX. Ong has been an executive director since joining Ho Bee Land in 1995, it said. Asiatravel.com said on Wednesday that the Singapore Court has granted the company a moratorium until 30 November restraining activities including any winding-up resolutions, the appointment of a receiver over any property of the company and commencing any proceedings against the company. The company has previously highlighted that it faced “minor cash flow issues” and a lack of qualified accounting staff. Temasek’s deemed interest in ST Engineering rose to 1.17 percent from 1.14 percent after an investment fund managed by a subsidiary of SeaTown bought 1.065 million shares in the market, it said in a filing to SGX after the market close on Wednesday. SeaTown is an independently managed Temasek portfolio company, it said. Temasek’s direct interest in ST Engineering remained unchanged at 49.84 percent, it said. Thai Beverage said on Wednesday that it issued debentures with an aggregate principal amount of 77.0 billion Thai baht, with fixed coupon rates ranging from 2.60 percent to 4.16 percent and seven tenors ranging from two years to 10 years. The debentures have been assigned a AA(tha) rating, which is considered investment grade by Fitch Ratings (Thailand), it said in the filing to SGX after the market close on Wednesday. OCBC said on Wednesday that it bought back 100,000 shares in the market at S$11.08 each for a total consideration, including other costs, or S$1.1 million. Since the April 2018 start of the buyback mandate, OCBC has bought back 6.325 million shares, or 0.151 percent of the issued shares excluding treasury shares at the time the mandate began, it said in a filing to SGX after the market close on Wednesday. Sembcorp Industries said on Wednesday that it bought back 200,000 shars in the market at S$2.9449 each for a total consideration, including other costs, of S$589,689. Since the April 2018 start of the buyback mandate, Sembcorp Industries has bought back 1.4 million shares, or 0.078 percent of the issued shares excluding treasury shares at the time the mandate began, it said in a filing to SGX after the market close on Wednesday. City Developments said on Wednesday that it bought back 100,000 shares in the market at S$8.81 to S$8.94 each for a total consideration, including other costs, of S$892,125. Since the April 2018 start of the buyback mandate, City Developments has bought back 1.6 million shares, or 0.176 percent of the issued shares excluding treasury shares at the time the mandate started, it said in a filing to SGX after the market close on Wednesday. Singapore Post said on Wednesday that it bought back 400,000 shares in the market at S$1.08 to S$1.11 each for a total consideration, including other costs, of S$437,321. Since the July 2018 beginning of the buyback mandate, SingPost has bought back 4.33 million shares, or 0.1913 percent of the issued shares excluding treasury shares at the time the mandate started, it said in a filing to SGX after the market close on Wednesday. Hyflux said on Wednesday that the High Court of Singapore has granted an extension of time until 21 September for the company to file its three-month affidavit on the progress of its reorganization since it was granted a six-month moratorium from creditor petitions. Coal player Geo Energy said on Wednesday that it is considering seeking a dual primary listing on the main board of the HKEx, which could involve the offering of new shares, while maintaining its listing in Singapore. The dual primary listing is aimed at broadening and diversifying the shareholders’ base, establishing a stronger investors’ presence in the Greater China and Hong Kong markets and improving the corporate profile and liquidity of the company’s shares, Geo Energy, which noted it is one of Indonesia’s top-10 coal producers, said in a filing to SGX after the market close on Wednesday. Geo Energy noted its coal is mainly sold in China, with 91 percent of 2017 revenue derived from coal exports to the mainland, where it had more than 10 percent of the thermal coal market last year. It has appointed Guosen Securities (HK) Capital as the sole sponsor, sole global coordinator, bookrunner and lead manager, Geo Energy said. Geo Energy requested that the trading halt on its shares be lifted on Thursday. Fincantieri SpA said on Tuesday that it extended the closing data for all the issued shares of Vard Holdings to 15 October at 5:30 P.M. SGT from 19 September. It added that it would not be extended beyond that time. In a separate filing to SGX, it said Fincantieri’s effective stake in Vard, including shares controlled or agreed to be acquired by the close of 18 September was 94.73 percent. The expected data for the suspension of trading in Vard shares will be 16 October at 9:00 A.M. SGT, it said. Ascendas Hospitality Trust’s manager said on Wednesday that Perpetual (Asia), in its capacity as the REIT’s trustee, has entered an agreement with Sumitomo Mitsui Banking, Singapore branch, for the grant of a five-year unsecured term loan facility of 5.5 billion Japanese yen. The facility will be used for the partial financing of the acquisition of Hotel WBF Kitasemba West, Hotel WBF Kitasemba East and Hotel WBF Honmachi, which was announced in June, it said in a filing to SGX. Ascendas Hospitality Trust’s manager said on Wednesday that a pool chemical mix-up, resulting in a gas leak, at the Pullman Sydney Hyde Park property on Wednesday resulted in around 30 guests and employees receiving medical attention. The hotel is under the portfolio of Ascendas Hospitality Trust and is managed by Accor, which is investigating the matter, it said. It said the situation is now under control. 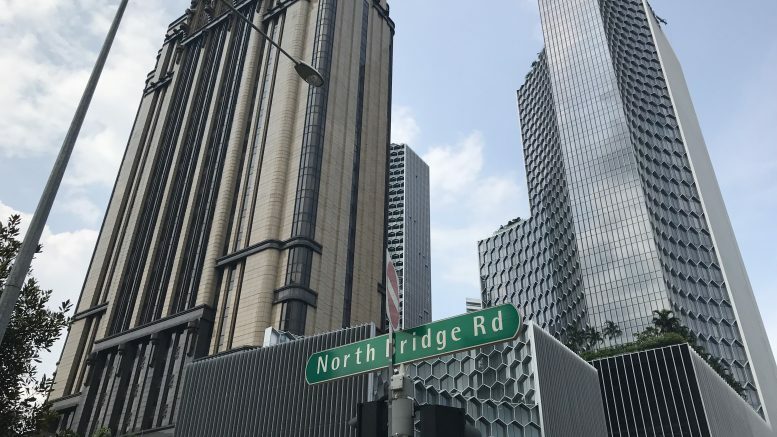 Stamford Land said on Wednesday that it bought back 709,900 shares in the market at S$0.50 each for a total consideration, including other costs, of S$351,976. Since the July 2018 start of the buyback mandate, Stamford Land has bought back 7.76 million shares, or 0.898 percent of the issued shares excluding treasury shares a the time the mandate began, it said in a filing to SGX after the market close on Wednesday. Silverlake Axis said on Wednesday that it bought back 1,411,300 shares in the market at S$0.4293 each for a total consideration, including other costs, of S$607,022. Since the October 2017 start of the buyback mandate, Silverlake Axis has bought back 179,250,000 shares, or 6.77 percent of the issued shares excluding treasury shares at the time the mandate began, it said in a filing to SGX after the market close on Wednesday. Q&M Dental said on Wednesday that it bought back 124,000 shares in the market at S$0.495 to S$0.505 each for a total consideration, including other costs, of S$62,404. Since the April 2018 start of the buyback mandate, Q&M Dental has bought back 8,803,300 shares, or 1.11 percent of the issued shares excluding treasury shares at the time the mandate began, it said in a filing to SGX after the market close on Wednesday. CapitaLand Retail China Trust’s manager said on Wednesday that 10.6 million new units in the trust will be issued at S$1.508 each to eligible unitholders who participate in the distribution reinvestment plan. That was in respect of the distribution of 5.39 cents per unit for the January-to-June period, it said. The new units will begin trade on 20 September, it said. This article was originally published on Thursday 20 September 2018 at 8:10 A.M. SGT; it has since been updated to add items on Straits Trading and Mapletree Logistics Trust.